It was a beautiful day in at the Botanical Garden this week and I was fully engaged. I get that way sometimes, loosing my sense of time and place as I see everything from fresh perspectives through my lens. Once again I was wandering through the Asian Gardens, towards the planter with a tree growing in the middle. I know this planter because it has been in my way many times when I have tried to frame a display on the other side. 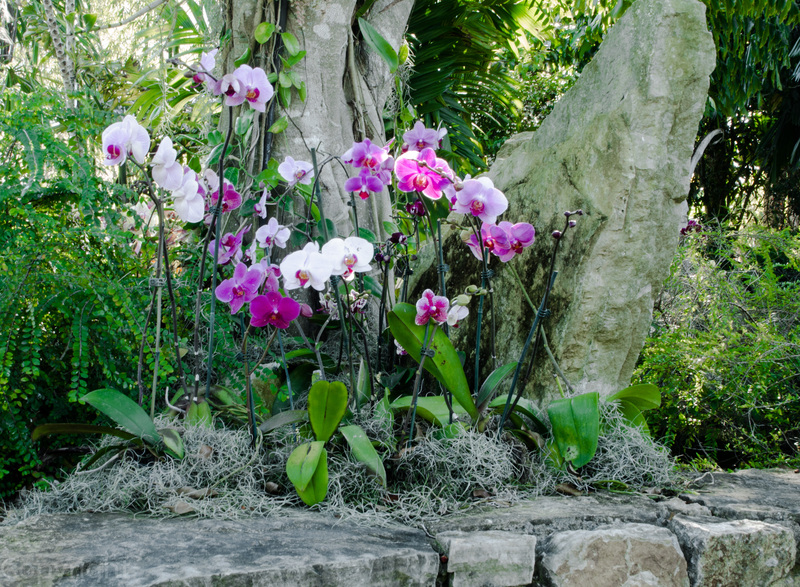 Today I was surprised to find it full of orchids. Good to see these photos in days such as today, with temperatures below freezing all day long. My photos may be my guilt offering to all of those I left behind when I came south for the winter. I’m glad they are bringing you pleasure because I know the cold can drag spirits down after a while. Lovely images Pat and so nice to see… beautiful colors and detail. Thank you, and also for visiting. A smile also helps a lot – thanks for sending me yours.